What the accusative case is, and how to use that too! We are going to take a brief break from the Jens and Julia love affair to talk about a very important part of the German language. We’ll catch up with the lovebirds later. The whole idea of cases is probably a little strange to English speakers because it’s not something we use very often in our own language. A “case” just means you somehow mark or change a noun to show what it’s doing in a sentence. Cases don’t show up too often in English, but they are essential in German. In English, we use word order to show who is doing what to whom. If we change the order of the words, we get a completely different meaning. That’s because word order really matters in English! But watch out! In German, word order is much more flexible than English. And in longer sentences, sentence parts can start moving around in strange ways. For example, verbs might jump to the end of the German sentence, or you might see three nouns sitting right next to each other in the middle of a German sentence. This is why cases are so important in German. You can use the "little words" in front of a noun to figure out who the subject and object are in a sentence. In other words, who is doing what to whom in a sentence. Let’s start with a simple sentence that looks a lot like English. In this one, it’s pretty easy to figure out which animal hates the other because of the word order. Der Vogel hasst den Hund. The bird hates the dog. But now, let’s look at another sentence. In this one, the verb (hasst) has moved to the very end of the sentence, and we have two nouns (der Vogel and den Hund) hanging out next to one another. Ich glaube, dass der Vogel den Hund hasst. 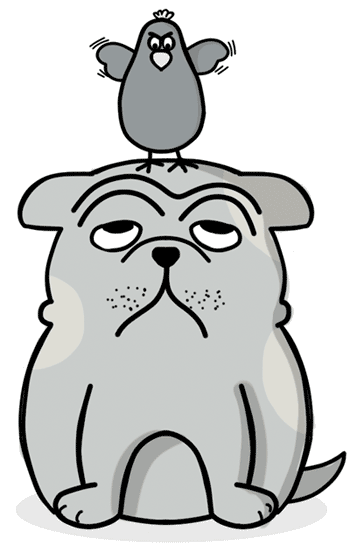 Literally: I think, that the bird the dog hates. But a German speaker has no trouble figuring out that little riddle, because the "little words" (der and den) are revealing everything, through (dun dun dunnnn!) the power of cases! We'll walk you through this in baby steps. First, we need to understand the different parts of a sentence. Here are some example sentences, and how to break them down into subject / verb / direct object. Jens plays the accordion for his girlfriend. Jens writes poetry at night. Jens’s bike lost a tire. Ok! Now that you've got that nailed, let's look at our first German case. It turns out that those little words (der/die/das) change depending on whether the noun is the subject of the sentence or the direct object. If the noun is the subject of the sentence (it is doing the action in the sentence), then it belongs in the nominative case. Luckily you already know each word for “the” when the noun is in the nominative case. Der Mann fährt das Auto. The man drives the car. See? You didn’t even have to learn anything for the nominative case because you already knew this. The "accusative case" is used when the noun is the direct object in the sentence. In other words, when it's the thing being affected (or "verbed") in the sentence. And when a noun is in the accusative case, the words for "the" change a teeny tiny bit from the nominative. See if you can spot the difference. Did you spot it? Yup, if the noun happens to be masculine, then when it is the direct object in the sentence, it changes to "den" instead of "der". All other genders stay the same. Take a look at this sentence. It has two masculine nouns (Mann, Ball) but the words for "the" are different. Der Mann findet den Ball. The man finds the ball. See how that works? 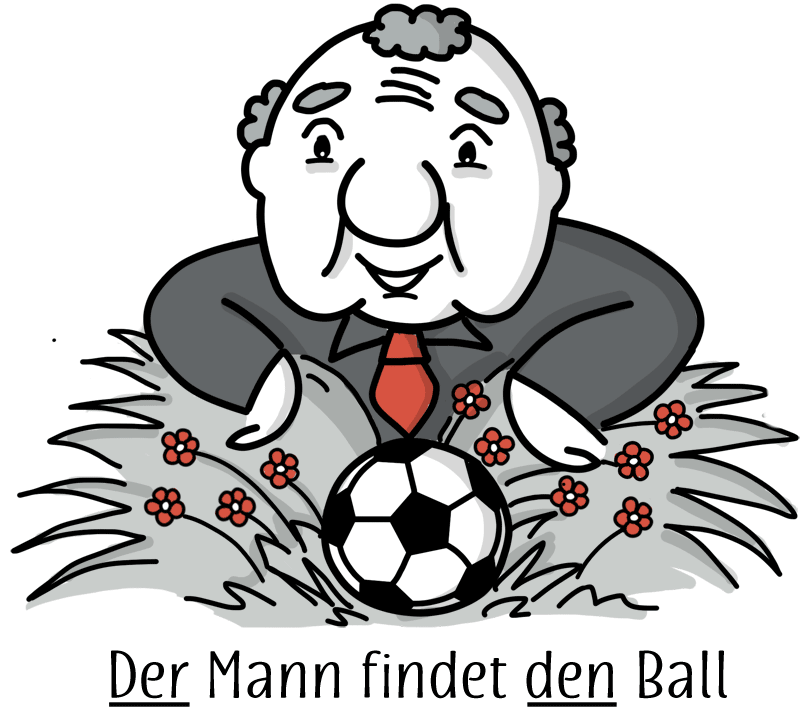 It's because der Mann is the subject/nominative, while den Ball is the direct object/accusative. Die Frau findet die Blume. The woman finds the flower. See how they're both the same? For everything other than the masculine words, the word for "the" is exactly the same for the subject/nominative as it is for the direct object/accusative. Up until now we've been using the accusative for things that are the direct object in a sentence: Or the thing being "verbed". But there's another time you'll use the accusative case. There are some connecting words (prepositions) which always signal that you should use the accusative case. That means, if you see any of these bad boys in a sentence, the noun after the word should be in the accusative case! Let’s look at some example sentences with these accusative prepositions. Die Frau pflückt zwei Blumen für den Mann. The woman picked two flowers for the man. Für is one of our accusative prepositions, so it signals that the next noun in the sentence (der Mann) should be in the accusative case. And because der Mann is a masculine noun, it changes to den Mann. Ich gehe um den Park. I go around the park. Um is another one of our accusative prepositions, which means der Park needs to be in the accusative case. And because der Park is a masculine noun, it changes to den Park. Ich gehe durch das Haus. I go through the house. That was a slightly tricky one. Durch is another one of our accusative prepositions, which means das Haus needs to be in the accusative case. But because das Haus is a neutral noun, it doesn't change. Wir singen ohne die Männer. We are singing without the men. Remember at the start of this lesson when you met a dog and a bird who just couldn't see eye to eye? We gave you a confusing sentence where it was hard to know whether the bird hates the dog, or the dog hates the bird. Using what you've learned in this lesson, can you tell who is doing the hating, and who is being hated? Take another look at the sentence above and try to work it out. Then check your answer below. Think you've figured it out? Correct translation: "I think that the bird hates the dog." Both "bird" (der Vogel) and "dog" (der Hund) are masculine nouns, and we can see in that sentence that der Hund has changed to den Hund. 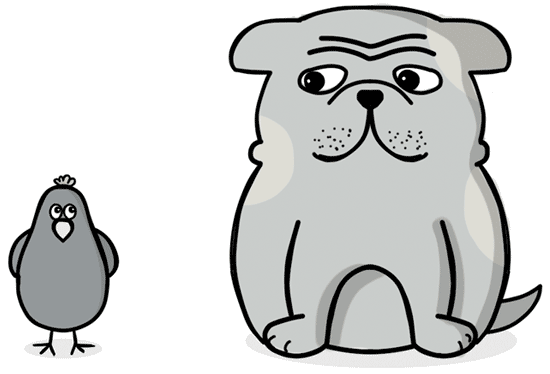 It's in the accusative case, which means the dog is the direct object in the sentence (or the thing being hated). So for some reason unknown to humans, the bird hates the dog. Mystery solved, thanks to cases!